Public relations are a crucial component of the health of your medical practice. If you don’t have a good relationship with your patients, or if you are unsure of how your patients view your practice, you could be in trouble. If your patients aren’t satisfied with the treatment that they’re receiving, they will most likely switch to another doctor, and if you don’t have patients, you don’t have a practice. Being aware is a requirement when it comes to public relations. Having knowledge of your relationship with the public will guide you towards your next step in improving a broken relationship, or forming altogether new ones. 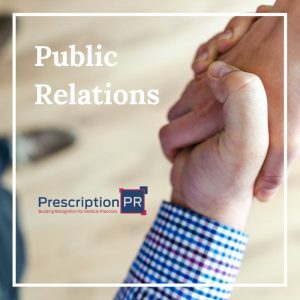 If you’re interested in improving your practice’s public relations and are looking for outstanding New York Healthcare marketing, Prescription PR is the place for you. Contact us here today! So, how does having positive relations with your public benefit your practice? If patients are hearing from your current patients about how professional and courteous your employees are at the front desk, or how fantastic your bedside manner is, they might make the choice to switch from their current doctor to you. If you have positive relationships with other practices, they may be more inclined to refer their patients to your practice. If you have positive PR with other practices, then you’ll most likely be highly regarded by other doctors. With public relations services, a professional can help you to build a relationship with fellow practices in your field to increase mutual trust. For a New York healthcare marketing firm that offers public relations services, contact us today for more information on how we can help you. How is your digital reputation? Have you checked on your digital reputation lately? No? Well, you aren’t alone. Many practices and doctors within those practices don’t even know that they may have a business or services profile on websites like Yelp, Google and ZocDoc. Practices are so busy with administrative and financial responsibilities that they have trouble keeping up with how they’re performing online. We are a New York healthcare marketing firm that offers reputation management services to ensure that negative online reviews from patients are being handled in the most appropriate and efficient manner. Having negative public relations is something that may cause patients to switch practices, resulting in declining patient numbers and little to no credibility among other doctors in the community. Make sure that your PR is positive with us today.